Manuscript submitted April 14, 2011; resubmitted May 2, 2011; accepted May 5, 2011. Human islet transplantation can provide good glycemic control in diabetic recipients without exogenous insulin. However, a major factor limiting its application is the recipient's need to adhere to life-long immunosuppression, something that has serious side effects. Microencapsulating human islets is a strategy that should prevent rejection of the grafted tissue without the need for anti-rejection drugs. Despite promising studies in various animal models, the encapsulated human islets so far have not made an impact in the clinical setting. Many non-immunological and immunological factors such as biocompatibility, reduced immunoprotection, hypoxia, pericapsular fibrotic overgrowth, effects of the encapsulation process and post-transplant inflammation hamper the successful application of this promising technology. 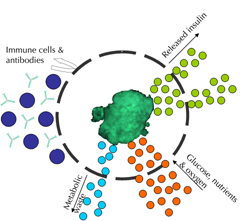 In this review, strategies are discussed to overcome the above-mentioned factors and to enhance the survival and function of encapsulated insulin-producing cells, whether in islets or surrogate β-cells. Studies at our center show that barium alginate microcapsules are biocompatible in rodents, but not in humans, raising concerns over the use of rodents to predict outcomes. Studies at our center also show that the encapsulation process had little or no effect on the cellular transcriptome of human islets and on their ability to function either in vitro or in vivo. New approaches incorporating further modifications to the microcapsule surface to prevent fibrotic overgrowth are vital, if encapsulated human islets or β-cell surrogates are to become a viable therapy option for type 1 diabetes in humans. Type 1 diabetes is an autoimmune disorder resulting from the destruction of insulin-producing β-cells in the pancreas , which leads to elevated blood glucose levels (BGL). It usually occurs in young children, but a growing number of cases are being documented in adults. Approximately 10% of people diagnosed with diabetes have type 1 diabetes , amounting to 145,000 Australians and millions worldwide. The most effective treatment currently available for type 1 diabetes is insulin therapy administered by subcutaneous injections, at least twice daily, or via an insulin pump. Although insulin therapy has greatly reduced mortality and improved life expectancy, it was soon realized that it was not as efficient in maintaining BGL within the physiological range as endogenous insulin. Moreover, there are often wide fluctuations . Clinical studies such as the Diabetes Control and Complications Trial (DCCT, 1993) have demonstrated a benefit in achieving optimal blood glucose control using intensive insulin therapy . Intensive glucose control has both advantages and disadvantages. Better control of BGL can delay, but not abolish, the development of microvascular complications. On the other hand, tight blood glucose control results in increased frequency of hypoglycemic episodes. In contrast, a β-cell in a non-diabetic person is able to secrete insulin minute by minute as required to maintain BGL within the reference range. The inability of exogenous insulin administration to achieve complete normalization of BGL highlights the need for alternative tissue therapies such as whole pancreas or islet transplantation. One of the closed-loop options available to a limited number of type 1 diabetic patients is whole pancreas transplantation. Whole pancreas transplantation has been carried out since 1966, and is usually performed in conjunction with a kidney transplant in patients with end-stage renal failure [5, 6]. Over the decades, improvements in surgical procedures and immunosuppressive protocols have resulted in successful whole pancreas transplantations alone. These are currently being carried out in many centers worldwide (see International Pancreas Transplant Registry, IPTR, 2004). A successful whole pancreas transplant provides a closed-loop system to achieve tight blood glucose control without hypoglycemic episodes. As a result, the number of pancreatic transplantations has increased dramatically. According to the latest available data, ~23,043 pancreas transplantations have been reported to the IPTR. Graft survival rate has improved dramatically with a survival rate of 76% and 62% at one year and three years, respectively. Long-term normoglycemia with insulin independence was achieved with a 5-year graft survival rate of 50-70% . However, though clinically successful, whole pancreas transplantation has its drawbacks. Apart from the major surgical intervention, there is morbidity from the procedure, associated with the need to drain the exocrine fluids for example, and from thrombosis of the graft. In addition, the recipients must adhere to a life-long immunosuppressive regime. Currently used anti-rejection drugs have a number of side effects such as increased susceptibility to infection, renal dysfunction, hyperlipidemia, anemia, mouth ulcers, and a theoretically increased risk of cancer . In some cases, side effects have been sufficiently severe for the anti-rejection drugs to be ceased. These drawbacks usually mean that whole pancreas transplantation is restricted to those requiring a kidney transplant. Thus, whole pancreas transplantation is not a viable option for most type 1 diabetes patients. The exocrine component forms the bulk of the pancreas (>95%). It is responsible for producing digestive enzymes, but does not contribute to insulin production. Thus, transplantation of the endocrine component of the pancreas alone (~1%) is a simpler approach, and one that should minimize complications arising from transplanting the exocrine component of the pancreas in a whole pancreas transplant. Transplantation of human islets to normalize BGL of people with insulin-dependent diabetes began in the 1970s , but it was not until 1989 that the first recipient was able to cease exogenous insulin . Between then and 2000, only 12% of islet recipients remained insulin-free 12 months after transplantation (Collaborative Islet Transplant Registry, CITR, 2007). In 2000, success rates improved dramatically with the incorporation of steroid-free immunosuppressive protocols. The Edmonton group reported seven out of seven consecutive transplants still being fully functional at 12 months follow-up . Some, but not all, other large research groups were able to recapitulate this wonderful result. A slightly modified Edmonton protocol is now used worldwide with successful results . However, in all centers, the success rates declined with time. Only 55% of initially insulin-independent recipients were still off exogenous insulin 6 months post transplantation, and 1% at 4 years post-trans-plantation (CITR, 2009). A follow-up study by the Edmonton group showed that only 4 of the 44 patients transplanted with human islets were insulin-independent at 5 years post-transplantation . However, clinical benefit was still observed from the transplanted islets in many recipients, who are now re-injecting insulin, as some insulin production continued from the grafted islets. This clinical benefit was manifested by the ability to recognize hypoglycemia, a problem which was the main reason for islet transplantation and associated immunosuppressive drugs. The reasons for failure of long-term graft function is not fully understood. Most likely, it is due to loss of β-cell mass through allorejection or autoimmune destruction of the grafted islets, as autografted islets survive and function better . Allotransplanted human islets are subjected to immunological insult from both autoimmune and alloimmune mechanisms. Different immunosuppressive strategies are used throughout the world to overcome the immune challenge. All anti-rejection drugs can cause side effects, some of which are unacceptable. Prior to the Edmonton protocol, immunosuppression regimes for islet transplantation included a combination of azathioprine, corticosteroids, and cyclosporine or tacrolimus. The anti-proliferative drug azathioprine causes gastrointestinal problems and bone marrow suppression . Calcineurin inhibitors, cyclosporine, and tacrolimus cause nausea, constipation, hypertension, neutropenia, ulceration, edema, hirsutism, fatigue, dyslipidemia, neurological disorders, and renal dysfunction. Calcineurin inhibitors are also diabetogenic through inhibiting insulin secretion from β-cells. Corticosteroids are also diabetogenic. These drugs exert their effect by enhancing insulin resistance. The limited success of initial islet transplantation trials may be attributed to the diabetogenic properties of corticosteroids, which would have inhibited graft function. The pitfalls in these initial trials were overcome with the Edmonton Protocol in 2000, which employed a glucocorticoid-free immunosuppressive regime including daclizumab, with low doses of sirolimus and tacrolimus. This landmark study resulted in insulin independence in all the seven recipients transplanted with human islets for >1 year . Since then, many centers around the world have reported promising results adopting the Edmonton rapamycin-based immunosuppression protocol . However, subsequent studies have shown that rapamycin has a deleterious effects on rats and human islets, and induces β-cell apoptosis . In a recent multicenter study comparing tacrolimus with cyclosporine, the prevalence of diabetes or impaired glucose tolerance was higher in the tacrolimus group suggesting its diabetogenic effects . Recently, new immunosuppression protocols have been introduced including the use of different T-cell-depleting agents, namely hOKT3γ 1 (Ala-Ala), thymoglobulin and alemtuzumab, the B-cell-depleting agent rituximab, and agents to induce peripheral tolerance such as anti-CD40L antibodies, and LEA29Y (belatacept) . Although the field of islet transplantation has progressed dramatically, the necessity of life-long immunosuppressive drugs greatly limits the wide availability of this promising therapy as an alternative to exogenous insulin. The benefits obtained from islet transplantation must clearly outweigh the immunosuppressive and surgical related risks. This limits the applicability of this therapy to the most severe cases of type 1 diabetes, where there are episodes of hypoglycemic unawareness and poor metabolic control, despite intensive insulin therapy. Thus, strategies aimed at overcoming life-long immunosuppression with minimal surgical procedures should increase the widespread applicability of human islet transplantation, thereby benefiting all patients suffering from type 1 diabetes. One such strategy to overcome life-long immunosuppression is the incorporation of encapsulation technology. Encapsulation of cells is a technology being explored to overcome the immune-mediated destruction of the graft without requiring toxic immunosuppression. The strategy of encapsulation involves placing islets within a semi-permeable membrane made of inert material. The membrane has pores which allow the passage of small molecules such as insulin (~6 kDa) and glucose but prevent the entry of immune cells (7 µm) and antibodies (~150-900 kDa). Thus, encapsulating human islets should prevent allograft rejection and autoimmune rejection, both of which are mediated by T cells, although it will not protect against toxic chemokines and chemokines which have a molecular weight of ≤30 kDa (Figure 1). The concept of immunoisolation dates back to the 1930s. Since then, many different types of encapsulation systems have been studied. Immunoisolation devices can be broadly divided into two categories: i) intravascular devices, and ii) extravascular devices. Figure 1. Encapsulation principle. The semi-permeable membrane allows the diffusion of insulin, metabolic waste, glucose, oxygen, and nutrients. At the same time, it prevents the entry of immune cells and large antibodies. In the intravascular devices, the islets are encapsulated within a hollow semi-permeable membrane containing many artificial capillaries made of polyacrylonitrile and polyvinylchloride copolymer. The islets are placed within the membrane, and the device is then directly connected to the host systemic circulation by vascular anastomoses creating an intravascular shunt. The major advantage of these intravascular devices is their close proximity with the recipient’s blood stream. The direct contact of the device with the blood stream ensures ample oxygen and nutrient supply, thereby enhancing graft survival and rapid glucose-stimulated insulin secretion. Despite many successful animal studies [20, 21], thrombus formation within the lumen of the device, or at the anastomotic sites, has proved to be a major obstacle requiring intense anticoagulation therapy. Furthermore, the risks involved with vascular prosthetic surgeries such as bleeding outweigh the benefits, thus making intravascular devices unsuitable for clinical application. Extravascular devices are based on the principle of simple diffusion chambers, which do not require the creation of intravascular shunts. Extravascular devices offer many advantages such as minimal surgical risk, transplantation into different sites, no risk of thrombosis, and ease of retrieval. Based on the size of the device, they are classified into two types: i) macrocapsular devices, and ii) microcapsular devices, with detailed descriptions in the recent reviews [22-24]. The macrocapsular devices are in the form of either tubular diffusion chambers or planar diffusion chambers. The tubular devices are usually made of copolymers containing polyacrylonitrile and polyvinylchloride produced with a smooth or fenestrated outer surface . The cylindrical shape and smooth surface of these devices greatly enhance their biocompatibility preventing any fibrotic overgrowth. Such a device has been used in the clinical setting with excellent graft survival at 2 weeks post-implantation . However, the major disadvantages with tubular chambers are their susceptibility to rupture and the requirement of large islet numbers to achieve normoglycemia because of low islet seeding density . The planar diffusion chamber consists of two flat sheets attached to a ring support, thereby imparting a flat configuration. The planar chambers are more stable compared to the tubular diffusion chambers and are thought to overcome hypoxia by supplying oxygen to the entire graft. However, initial studies using this device resulted in graft failure with dense pericapsular fibrotic overgrowth [27, 28]. One of the major advantages of extravascular macrocapsules is their easy retrievability after implantation. The major disadvantage is the limited oxygen diffusion and nutrient transport which compromise islet viability and function. Several bilayered planar devices such as Boggs chamber and TheraCyte have been developed to enhance vascularization and subsequently provide effective immunoisolation [29, 30]. Xenotransplantation studies with TheraCyte allowed neonatal porcine islets to survive in cynomolgus monkeys for up to 8 weeks . 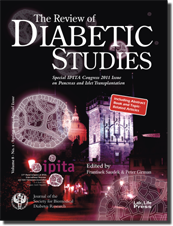 A more recent study has shown that preimplantation of TheraCyte devices enhanced vascularization and reduced the curative dose of islets subsequently injected into the device needed to normalize blood glucose levels in diabetic laboratory rodents . Furthermore, human fetal pancreatic tissue placed in TheraCyte devices and transplanted into laboratory rodents resulted in their differentiation into insulin-producing cells, although they were not fully mature . Though all of the above-mentioned studies depict extravascular macrocapsular devices as an appealing candidate for clinical application, limited graft survival impedes their clinical use. Microcapsules are smaller than macrocapsules and are spherical in shape providing a large volume-to-surface area ratio. In microencapsulation, generally one or a few islets are encapsulated within a spherical semi-permeable membrane. Microcapsules possess many advantages over macrocapsules. Therefore, this is the most widely utilized system for designing a bioartificial pancreas. Microcapsules are mechanically stable and are very simple to construct. The simplicity in the manufacturing process gives freedom to alter key parameters such as pore size, thickness, and permeability. The enhanced surface-to-volume ratio provides better diffusion properties. They can be implanted into patients by simple procedures without major surgery. However, a major disadvantage is the difficulty associated with the retrieval of microcapsules from the recipient, especially if there is pericapsular fibrotic overgrowth. Generally, microcapsules are produced from polymers which form hydrogels under certain conditions. They are derived either naturally or through synthetic routes. In islet transplantation, the naturally obtained alginate hydrogels are widely used as they can be produced under physiological conditions without the use of toxic chemicals and without affecting islet function . The commercially available alginates are obtained from seaweed (brown algae) and are polysaccharides composed of β-D-mannuronic acid and α-L-guluronic acid linked together. There are both high guluronic acid (G) and high mannuronic acid (M) containing alginate and, depending on the source, alginates vary in composition and ratio of G:M. Alginate when dissolved results in a highly viscous solution depending on its molecular weight which can then be used to create small droplets. The droplets can then be stabilized to become microcapsules by immersion within a solution of polycations such as Ca2+ or Ba2+ which forms strong cross-links with the monomers guluronic and mannuronic acids . Microcapsules made from high G alginate are more rigid and stable compared to the high M microcapsules. The latter are associated with increased swelling which may result in inadequately encapsulated islets. Apart from alginate, many other polymers such as agarose, chitosan, methacrylic acid, methyl methacrylate, polyethylene glycol and 2-hydroxyethyl methacrylate (HEMA) have been used for islet encapsulation studies with limited success . 1. Incorporation. In this step, the islets are mixed within the polymer solution which makes up the microcapsules. 2. Dispersion. This step involves the dispersion of cells into small droplets, thereby producing microcapsules, each containing 1-2 islets. 3. Stabilization. The droplets formed are solidified to increase the strength of microcapsules. Several methods were employed to form droplets in the dispersion step such as extrusion or emulsification. The emulsification method employs a closed system where the islets are mixed with the polymer solution in a reactor. This is a less popular method. Extrusion is a process where the islets mixed within a polymer solution are forced through a nozzle, and the droplets are formed under the influence of gravity, coaxial airflow, or electrostatic potential. The simple dropping method under gravity uses the phenomenon of gravitational force and surface tension to make microcapsules. Though technically very simple, the microcapsules produced by this method are typically larger (>1000 μm) and involve batch-to-batch variations. Under coaxial air flow, the droplets are formed by ejecting the liquid from the needle under a controlled air jet, thereby producing smaller, more uniform capsules (200-1000 μm). The coaxial airflow is the most widely used method both in our center (Figure 2) and other laboratories producing microencapsulated human islets. It has been shown that by applying electrostatic potential between the needle and the gelation solution, smaller microcapsules with uniform size (<200 μm) can be obtained. However, the high electrostatic potential applied might interfere with cell survival. Figure 2. Schematic representation of the air-driven droplet generator. 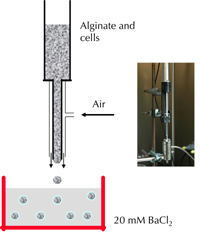 The figure depicts the principle of encapsulation (left) and the encapsulation apparatus (right) attached to a 1 ml syringe containing the cells and alginate suspension. The next step is to solidify the liquid droplets formed to produce microcapsules. This is called the stabilization process and is generally achieved using gelation, polymerization, coacervation, or solvent evaporation. Gelation and coacervation are the most widely used methods for islet encapsulation. In gelation, the liquid droplets, which contain the islets, are collected in a precipitation bath containing polycations such as CaCl2 or BaCl2. As they possess a negative charge, the guluronic and mannuronic acid components of the alginate polymer form strong cross-links with the polycations producing rigid microcapsules . More recently, calcium alginate microcapsules with excellent morphological characteristics have been produced using a semi-automated vibrational nozzle encapsulation device with a very narrow size distribution . Based on the combination of polymer and gelling cations, many different types of alginate microcapsules can be produced. The two types of alginate microcapsules which are extensively studied are i) alginate-poly-l-lysine alginate (APA) microcapsules, and ii) barium alginate microcapsules. Lim and Sun were the first to describe the use of microcapsules as a bioartificial pancreas. They used the alginate-poly-l-lysine-alginate recipe to make the capsules followed by degelling to obtain a liquid capsule core . In this study, the researchers used a high M alginate because of its strong affinity with poly-l-lysine (PLL) and its ability to dissolve more easily than high G alginate. Following this, many studies were carried out to replace the liquid core, as microcapsules with a solid core are stable and mechanically stronger. Since high M alginate is associated with increased swelling, later studies utilized high G alginate with reduced osmotic swelling to make solid core APA microcapsules. A study by de Vos et al. showed that high M alginate may lead to insufficient islet encapsulation and islet protrusion . Furthermore, high M alginate elicited a strong immune response with increased antibody and cytokine production compared to high G alginate . Transplantation of high M APA microcapsules resulted in elevated levels of fibrogenic cytokines, macrophages, and lymphocytes leading to pericapsular fibrotic overgrowth . This discrepancy in the literature concerning the biocompatibility of high G and M alginate led de Vos et al. to compare the host responses against APA microcapsules made from different alginate compositions using Manugel (high G) and Keltone LV (intermediate G) . Surprisingly, the pericapsular fibrotic overgrowth was more intense against the Manugel (high G) capsules than the Keltone (intermediate G), in contrast to earlier studies. However, further experiments using high G capsules without PLL showed no fibrotic overgrowth, suggesting that the immune response is not against the alginate but the inadequately bound PLL in high G microcapsules. This is in agreement with other studies where fibrotic overgrowth was reduced in low G APA microcapsules compared to high G APA capsules, suggesting strong binding of PLL to mannuronic acid [44, 45]. It has been demonstrated that high M alginate capsules are not as biocompatible as high G, even in the absence of PLL. High M alginate has been shown to be immunogenic by stimulating monocytes and inducing antibody production compared to high G counterparts . Many animal studies have been carried out using islets encapsulated in APA microcapsules and transplanted into mice, rats, monkeys, and dogs . The encapsulated islets were generally implanted into the peritoneal cavity, and normoglycemia was achieved within a few days after transplantation. Even in a xenotransplantation setting, islets encapsulated in APA microcapsules survived well and resulted in long term normoglycemia . A slightly modified microcapsule employing poly-l-ornithine (PLO), alginate-polyornithine-alginate (APO), resulted in survival of neonatal pig islets for eight weeks when transplanted into cynomolgus monkeys . A few clinical trials have been carried out with alginate-PLL or alginate-PLO microcapsules. The first trial was reported in 1994, when Soon Shiong et al. achieved insulin independence in a patient allotransplanted with alginate-PLL encapsulated islets but given a low-dose of immunosuppression . Almost 12 years later, Calafiore et al. carried out a phase 1 clinical trial using human islets encapsulated in calcium alginate-PLO without immunosuppression . Although this study proved that allografting of encapsulated islets is safe, only a minor clinical benefit was observed. Despite such encouraging results, alginate-PLL microcapsules suffer from a major drawback. The PLL coating used in these microcapsules is immunogenic, evoking a fibrotic overgrowth making them highly bio-incompatible . Also, it has been shown that PLL coating degrades over time. Consequently, this leads to alginate matrix destabilization suggesting that alginate-PLL microcapsules are not stable in the long term . To overcome the shortcomings associated with alginate-PLL microcapsules, many laboratories around the world have cross-linked alginate with barium ions instead of calcium and without PLL to make barium alginate microcapsules. A detailed study by Morch et al. indicated that the gelation ion Ba2+ rather than Ca2+ yielded microcapsules of higher strength and stability when used with high G alginate, although this was not the case with high M alginate . The study also demonstrated that high G barium alginate microcapsules were less permeable to IgG compared to other microcapsules. The absence of PLL makes these capsules highly biocompatible compared to the APA microcapsules . Furthermore, encapsulation of islets in barium alginate preserved islet function in vitro with similar insulin secretion compared to non-encapsulated islets . In vivo, there are a number of studies demonstrating the capability of barium alginate microcapsules to provide long-term immunoprotection both in an allo- and xeno-transplantation setting [55, 56]. However, even in the absence of PLL, these microcapsules eventually become overgrown with fibrotic tissue. This is probably as a result of the inflammatory response by the host to antigens shed from the encapsulated cells which leave the capsule through its pores. There is a phase 1 clinical study conducted with barium alginate microcapsules by Tuch and his investigators . In this study, four type 1 diabetic patients with no detectable C-peptide were infused with human islets encapsulated within barium alginate microcapsules intraperitoneally without immunosuppression. C-peptide was detected on day 1 post-transplantation, and BGLs and insulin requirements decreased, albeit transiently. C-peptide was undetectable by 1-4 weeks. In a multi-islet recipient, C-peptide was detected at 6 weeks after the third infusion and remained detectable at 2.5 years. Neither insulin requirement nor glycemic control was affected by the release of this small amount of insulin. To understand better what was occurring in the transplanted capsules, a laparoscopy was performed in the recipient of the four islet infusions at 16 months after the first infusion. Large numbers of capsules were found scattered throughout the peritoneal cavity in clusters attached to the parietal peritoneum, spleen, omentum, and kidney. A biopsy showed the capsules to be intact and surrounded by fibrous tissue containing thin-walled capillaries with a mild histiocytic response. Islets were necrotic. The loss of graft function was probably due to either ischemic necrosis or an inflammatory process, possibly initiated by fibrinogen adhering to the capsule surface . 1. Calcium-alginate PLL with solid core. 2. Calcium-alginate PLL with liquid core. 4. Barium alginate without PLL in a xenotransplantation setting. They found that all four types of microcapsules were biocompatible with barium alginate capsules in vivo, those without PLL being the most biocompatible. As late as 9 months post-transplantation, >99% empty capsules were freely floating without fibrotic overgrowth. When adult porcine islets encapsulated within these four types of microcapsules were xenotransplanted, graft survival was longer in the group receiving barium-alginate capsules without PLL with less host cell adherence. The investigators also demonstrated that addition of PLL coatings to barium-alginate microcapsules significantly decreased graft survival. Similar results were obtained in a study by Trivedi et al. where barium alginate macrobeads demonstrated increased islet viability and retrievability compared to alginate-PLL macrobeads in a syngeneic transplantation setting . Both these studies demonstrate that barium alginate microcapsules without PLL are more bio- and immunocompatible than alginate-poly-l-lysine-alginate microcapsules. However, despite the success in animal studies using both alginate-PLL and barium alginate microcapsules, none of these microcapsules proved superior in protecting islet allografts in clinical trials. Several factors influence the success of encapsulated islet survival and function which are discussed below. Many factors influence the survival and function of microencapsulated human islets. The most important factors are biocompatibility, immunoprotection, hypoxia, the encapsulation process and cytoprotection. Survival rates of both allografted and autografted encapsulated islets are similar suggesting that immune rejection alone is not the cause of graft failure . Bioincompatiblity of the microcapsules leads to pericapsular fibrotic overgrowth which is responsible for islet cell death. The fibrosis, comprised mostly of macrophages and fibroblasts, occurs in the immediate post-transplantation period affecting only a small percentage of microcapsules . This small percentage of fibrotic overgrowth accounts for nearly 40% loss of the transplanted islet mass. Lack of biocompatibility can be attributed to the purity and shape of the encapsulation material. Highly purified alginate is required to improve the biocompatibility of microcapsules . Purification of alginate by removing impurities such as polyphenols and endotoxins greatly enhanced the biocompatibility of alginate microcapsules . Commercially available alginates contain many contaminants which are immunogenic and affect the biofunctional properties of microcapsules compromising biocompatibility . Even after the removal of endogenous contaminants, purified alginates still contain residual protein contaminants which are immunogenic. Purification of protein contaminants by size exclusion chromatography and subsequent barium alginate bead formation resulted in less fibrotic overgrowth compared to the unpurified alginate . Irregularities in microcapsule shape lead to pericapsular fibrotic overgrowth (PFO) and islet necrosis, although this accounts for fewer than 5% of the capsules. The physical irregularities are due to inadequate encapsulation which leads to protuberance of the islets, thereby initiating an immune response which causes fibrotic overgrowth . As discussed above, the physical irregularities can be reduced by using the gelation ion Ba2+ instead of Ca2+ during the encapsulation procedure . Also, the barium alginate microcapsules are devoid of the PLL layer which is highly immunogenic. Chemical modification by coating the microcapsules with polyethylene glycol (PEG) improves biocompatibility by preventing fibrotic overgrowth . Immunoprotection is the ability of the microcapsule to protect the encapsulated islets from both the usual rejection mechanisms and recurring autoimmune destruction. Fibrotic overgrowth is even seen in microcapsules with a smooth capsular surface, suggesting that causative factors other than alginate composition and shape contribute to this cellular overgrowth. Although a proper encapsulation system should protect against cells and large antibodies, the islets are still vulnerable to small molecules such as chemokines/cytokines and nitric oxide (NO) . Inadequate immunoprotection results from permeability of the microcapsules to these small molecules. These small molecules are produced by the islets themselves, which can leak through the pores of the microcapsule and attract macrophages . This process, called chemotaxis, can cause graft failure. Chemoattractants such as alpha 1,3-galactose can activate macrophages, thereby releasing pro-inflammatory cytokines, interleukin-1 beta (IL-1β), tumor necrosis factor alpha (TNF-α), interferon gamma (IFN-γ), and small molecules such as NO. These molecules, being so small (~2-30 kDa), can easily pass through the microcapsule membrane. Chemotaxis can also occur through monocyte chemoattractant protein 1 (MCP-1), a 12 kDa chemokine , produced by the islets which can easily leak through the pores of the microcapsules. Reducing the microcapsular permeability should prevent the passage of these small molecules. However, reducing the pore size will also interfere with the diffusion of nutrients and insulin which has a molecular weight of ~6 kDa. Ultrafiltration membranes have been shown to protect islet xenografts from immune insult but at the expense of limited graft survival resulting from poor nutritional transfer . Thus, achieving a critical pore size which provides immunoprotection without compromising islet function is crucial. Several strategies have been studied to immunoprotect the encapsulated islets and improve islet function. These include co-encapsulation with various agents such as erythrocytes and sertoli cells [70, 71] which release immunosuppressive factors. Cross-linking hemoglobin on the microcapsular surface has been shown to protect islets from the NO induced cellular damage and improve islet function . Also, genetic engineering of the islets to secrete anti-inflammatory molecules such as inhibitor of TNF-α (TNFi) and interleukin-1 receptor antagonist (IL-1RA) leads to reduced β-cell damage from the deleterious small molecules secreted by activated macrophages [73, 74]. Immunomodulation strategies employing costimulatory blockade along with microencapsulation has helped in the long-term survival of encapsulated porcine islets . Recent studies involving encapsulated islets in a modified microcapsule, namely sulphated glucomannan-barium-alginate (SGA), resulted in decreased secretion of proinflammatory cytokines and improved functional capacity of rat islets due to its heparin-like properties in absorbing and filtering cytokines . Another factor which contributes to islet graft failure is hypoxia. Native human islets reside in a microenvironment supplied with a dense network of capillaries thereby enjoying ample blood supply, oxygen (pO2 of 40 mmHg) and abundant nutrients . However, the capillary networks are destroyed during the isolation process and the islets suffer from post-isolation hypoxic stress. Furthermore, transplanted islets suffer from hypoxia in the immediate post-transplantation period (with mean pO2 of 5-10 mmHg) until revascularization occurs during the next fortnight, leading to reperfusion injury and cell death. Microcapsules also prevent the revascularization process, thereby subjecting the islets to further hypoxic stress. The absence of revascularization and limited oxygen supply subject the encapsulated islets to irreversible and chronic hypoxic stress. This also hampers the ability of the microencapsulated islets to release insulin and function properly thereby requiring large numbers of encapsulated islets to reverse diabetes compared to non-encapsulated islets . Several strategies such as pre-vascularization [79, 80], heat shock , ischemic preconditioning , and stimulation of Bcl-2/Bcl-xl complex  have been investigated to minimize hypoxic stress, and prevent apoptosis in the immediate post-transplantation period with non-encapsulated islets. All the above strategies provided protection only in the immediate post-transplantation period but not in the long-term where hypoxia becomes an issue for microencapsulated islets. Development of host vasculature towards the microencapsulated islets should enhance oxygen supply and prevent long-term hypoxic damage. This may be achieved by co-encapsulating vascular endothelial growth factor (VEGF) proteins with islets and has been shown to improve insulin and glycemic control post-transplantation . Encapsulation of islets in a rough surface employing hydroxymethyl polysulfones resulted in enhanced vascularization and improved islet function . Co-encapsulation of photosynthetic oxygen generator algae with islets in alginate microbeads resulted in greater insulin release in response to glucose under light when perifused with oxygen-free medium . Recently, it has been shown that alginate microbeads loaded with fibroblast growth factor-1 (FGF-1) displayed enhanced local neovascularization . The foremost requirement for adequate cell encapsulation is that the encapsulation procedure itself should not be harmful to cell survival. Alginate is the most widely used polymer for cell entrapment and can be simply produced under physiological conditions without use of toxic cross-linkers or chemicals . It is the polymer of choice when it comes to encapsulating islets and insulin-producing cells. Alginate composition and encapsulation affect growth characteristics and insulin secretion of insulin-producing cells . High G alginates hindered cell growth and metabolic activity as compared to high M alginate. A study by Simpson et al. demonstrated that the encapsulation process affected the biochemical processes involved in insulin secretion . However, the study attributed this effect to the trypsinization step rather than to the encapsulation procedure itself. The scope of the abovementioned studies was limited as the effect of encapsulation was examined only on specific parameters such as cell growth, metabolism, and insulin secretion of insulinoma cell lines instead of primary human islets. This lack of data may be a contributing factor to the failure of this promising technology leading to inconsistent results and poor reproducibility. Cytoprotection can be achieved either through pharmacological approaches or through bioengineering approaches. Several strategies have been investigated or are currently under investigation to protect the encapsulated islets from the cytotoxic insults in vivo resulting from hypoxia and inflammation. Inducing expression of superoxide dismutase (SOD), catalase (CAT) or glutathione peroxidase (GPX) in insulin-producing cells protects them from free radical toxicity and the adverse effect of NO . Giovagnoli et al. demonstrated the beneficial effects of SOD and CAT by entrapping them within a polymer matrix as slow release preparations when co-cultured with neonatal porcine islets . Other drugs such as nicotinamide and 15-deoxyspergualin (DSG) protect islets and promote long-term graft survival and function [93, 94]. Cytoprotection could also be achieved by modifying the microcapsules or coating the microcapsules with anti-inflammatory agents. Recently, it has been shown that cross-linking the anti-inflammatory peptide interleukin-1 receptor (IL-1R) inhibitory peptide to PEG hydrogels protected the encapsulated insulin-producing cells from pro-inflammatory cytokines and T lymphocytes . Modification of the microcapsules by incorporating barium alginate hydrogel within the center of APA microcapsules reduced the permeability and prevented the entry of antibodies and complement, compared to unmodified capsules . Another major obstacle to the clinical application of microencapsulated human islets is the high volume of the implant, which generally restricts the transplantation site to the peritoneal cavity. Attempts to reduce this number might be achieved by increasing the functional efficiency of the islets, that is, enhancing insulin secretion. This can be achieved by treating the islets with oral hypoglycemic agents such as sulfonylureas. Capitalizing on this, Hwang et al. and Park et al. prepared a polymeric conjugate of sulfonylureas and demonstrated increased insulin secretion by co-encapsulating the conjugate with islets and insulin-producing cell lines respectively [97, 98]. However, the increased insulin secretion was seen only at basal levels and did not increase with elevated glucose concentrations. This drawback was overcome by co-encapsulating the islets with polymeric conjugate of glucagon like peptide 1 (GLPf1) . Diabetes and its complications have a significant impact both on the individual as well as society with the annual direct and indirect costs exceeding 90 billion dollars (www.who.int). More than 220 million people worldwide are affected by diabetes and it is estimated that its incidence might increase 3-4% per year. The availability of organ donors is a major hurdle for widespread pancreas and islet transplantation as the demand for organs far exceeds the supply. To address the problem of organ shortage, researchers have attempted to utilize alternate sources of β-cells. Alternate sources of β-cell surrogates that are currently under examination include genetically engineered insulin-producing cells, xenogenic islet cells, and stem cells. Xenogenic islets, in particular porcine islets, have been considered as a potential alternative. Three types of pig "islets" are being examined, those isolated from the fetal, neonatal, and adult pancreas. Both fetal  and neonatal pig tissue  has been transplanted into humans, with neither a confirmed functional benefit nor any adverse consequences observed. A concern which stopped clinical trials for almost a decade was the fear of transmission of porcine endogenous retroviruses (PERV), creating a possible pandemic. However, long term follow-up of patients and monkeys transplanted with porcine tissue show no evidence of PERV infection [102, 103]. Xenotransplantation of porcine tissue is afflicted with problems due to hyperacute rejection as a result of preformed antibodies in the recipient reacting to the galactose-alpha (1,3)-galactose (Galα(1,3)Gal) epitope. However, this could be overcome using microencapsulation technology. Microencapsulated neonatal porcine islets have been able to normalize BGL and respond to glucose when transplanted into diabetic immunocompetent mice . Similarly, a study from our center has shown that encapsulated fetal pig islet-like cell clusters (ICCs) can differentiate, mature, and normalize BGL when implanted into the peritoneal cavity of diabetic rodents . However, long-term success is limited, as cellular overgrowth comprised of immune cells was found attached over the entire surface of the capsules, causing cell death probably caused by hypoxia, nutrient deprivation and accumulation of toxins. Despite the paucity of data available on microencapsulated porcine islets (one reported case transplanted with encapsulated neonatal ICCs), there has been recovery of live cells 9.5 years post-transplantation , which raises hope for this therapy in the future. Retrospectively, clinical trials with microencapsulated neonatal ICCs have been recently reactivated, with approval to do so given in New Zealand, Moscow and most recently Argentina (www.lctglobal.com). Genetically engineered insulin-producing cells include those generated by the transdifferentiation of gut and liver cells, and have been shown to be effective in animal models . However, transdifferentiation remains a complex and poorly understood area of research. Stem cells, both adult and embryonic, have been the subject of extensive investigations as an alternative source of β-cell surrogates. Adult stem cells are elusive. Studies of adult pancreatic stem cells have cast doubts on their ability to differentiate into mature β-cells [108, 109]. Recent studies have been able to derive insulin-producing cells from human embryonic stem cells [110-112]. Although certain properties of functional insulin-producing β-cells were lacking from the differentiated cells, the studies showed the promise of human embryonic stem cells (hESCs) as a potential β-cell replacement therapy. Novocell (now Viacyte Inc.) has described a method for the production of hES-derived pancreatic progenitors  which efficiently generate functional β-cells when transplanted . Our data demonstrating that microcapsules can be used for differentiation of hESCs into definitive endoderm in 3D  suggest that maturation of encapsulated human pancreatic progenitors derived from hESC may also occur. Furthermore, the microcapsules prevented teratoma formation when mouse embryonic stem cells (mESCs) and hESCs were encapsulated and transplanted into immunodeficient mice . Also, the 3D composition offered by the microcapsules has been shown to promote growth, differentiation, and maturation of different cell types such as mESCs [114-116], hESCs [114, 117], hepatocytes [118, 119], and mesenchymal stem cells . Thus, microencapsulation technology could provide a safe platform for clinically evaluating the different cell-based therapies for type 1 diabetes by protecting the patients from the risk of tumor formation originating from the transplanted cells. Alginate-based microcapsules, either alginate-poly-l-lysine-alginate (APA) cross-linked with calcium or alginate cross-linked with barium, are the most widely studied encapsulation systems for the generation of a bioartificial pancreas. Despite promising animal studies with both types of micro-capsules, there has been limited clinical success [49, 57]. Apart from hypoxia to the encapsulated islets, limited immunoprotection and bioincompatibility are believed to be factors responsible for this . Recent studies from our center show that pre-treating encapsulated human islets with desferrioxamine (DFO) can reduce hypoxic stress and decrease the number of islets required to achieve normoglycemia by increasing vascular endothelial growth factor (VEGF) expression . The reduced immunoprotection of the barium alginate microcapsules may be attributed to the larger pore size, which allows the leakage of immunostimulatory molecules initiating an inflammatory response and resulting in pericapsular fibrotic overgrowth. Thus, strategies aimed at reducing pore size should prevent pericapsular fibrotic overgrowth and improve graft survival. Currently, we are investigating the strategy of heparin immobilization on barium alginate microcapsules to prevent PFO. Preliminary results have shown that coating heparin on alginate microcapsules reduced the fibrotic overgrowth in the allograft model, but not in the xenograft model in rats. The other major reason for the failure of the bioartifical pancreas is bioincompatibility leading to PFO. In a recent study, we determined the biocompatibility of the barium alginate microcapsules in both small animals (rodents) and a large animal (baboon) . In small animals, barium alginate microcapsules were biocompatible without any PFO for up to 4 months, as opposed to the baboon where PFO was seen even by 1 week post-transplantation. However, transplantation of empty microcapsules into the baboon resulted in fibrotic overgrowth by 1 week post-transplantation with the intensity of this reaction increasing by 2 weeks. Similar results have been obtained with empty calcium alginate microcapsules implanted into the peritoneal cavity of the baboon (B. Strand, personal communication). The fibrotic response to empty microcapsules in the baboon, but not the mouse or the rat, raises concerns about the use of rodents to predict outcomes when microcapsules are implanted into humans. This study emphasizes the fact that thorough validation of different animal models is essential to predict the clinical outcome with encapsulated islets. Our recent study reveals that even a humanized NOD mouse model does not mirror the fibrotic response observable in humans adequately, as fibrotic overgrowth is almost absent after several weeks of transplantation . The small fibrotic overgrowth around the microencapsulated human islets failed to stop the encapsulated islets from functioning in the diabetic recipient mice. The polymers/hydrogels used for encapsulation should be standardized to reduce inter- and intra-laboratory variability and to produce consistent results. This is in terms of their composition, physicochemical properties, purity, effect of polymer material, and different encapsulation procedures on the encapsulated cells of interest. In this regard, in our center we investigated the effect of alginate encapsulation on the global gene expression and microRNA (miRNA) profile of human islets. We found that encapsulation of human islets in barium alginate microcapsules caused no significant changes in mRNA and miRNA expression profiles. Another challenge is the scaling-up of the manufacturing process to produce encapsulated cell-based therapies for diabetes with reproducibility and meticulous quality controls under GMP guidelines. Such rigorous manufacturing practices are essential if microencapsulated cell-based therapies are to enter clinical trials and create a therapeutic impact on people with diabetes. Another major area of study is the tracking of encapsulated cells in a non-invasive way to determine when microcapsules become surrounded by fibrous tissue in some transplant situations. In conclusion, microencapsulating insulin-producing cells in alginate is safe, and strategies to reduce the adverse effect of hypoxia and PFO can be devised. However, further modifications of the microcapsules are required if PFO is to be completely prevented, and encapsulated cell-based therapies are to become a viable option as therapy for type 1 diabetes in humans. Acknowledgments: We wish to thank the members of the Chicago Diabetes Project, in particular its leader, Professor Jose Oberholzer, for their valuable contribution both on an academic and practical basis to achieving a clinically useful microcapsule. We also wish to thank members of the Diabetes Transplant Unit involved in microencapsulation, namely Dr Sophia Dean, Dr Jayne Foster, Ms Lindy Williams, Dr Methichit Chayosumrit and A/Prof Kuldip Sidhu. Financial support for encapsulation came from the National Health and Medical Research Council of Australia, the Australian Foundation for Diabetes Research, and the University of Illinois at Chicago. Cell therapy of type 1 diabetes mellitus: A bioartificial pancreas, or nothing?